Organizers of a high-speed ferry that would link South County and the other side of the Bay are asking residents to support the project and to send emails backing the venture to county commissioners. Commissioners will decide at their Feb. 18 meeting whether Hillsborough County will go to the next step in the project. The proposal begins with two catamarans that would run between the Schultz Preserve area and MacDill Air Force Base, with the first anticipated riders being the 5,300 MacDill employees who commute between 25 and 35 miles daily across the Bay. “Surveys we’ve performed show the average MacDill employee spends about $245 in transportation costs back and forth to work,” said Mark Fernandez of HMS Ferries Inc. in a public meeting at Hillsborough Community College last June. HMS Ferries, which runs The Statue of Liberty and Alcatraz Tours ferries, wants to operate Tampa Bay’s high-speed ferry. The two catamarans would begin the six-mile straight-across service approximately every 20 minutes from 6 to 9 a.m. and resume from 4 to 6 p.m. for MacDill employees, then add to the service as others signed on, Fernandez said. 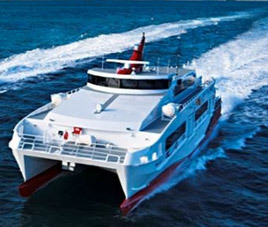 A third catamaran would be added later for public use if the venture proves profitable, Fernandez said. Surveys indicate there are 1,750 people in the Riverview/FishHawk area; 1,096 in the Alafia area; and 1,181 in Ruskin and Apollo Beach who would be potential ferry riders immediately because of their place of employment. “It’s an ideal situation for us with so many people leaving from a similar place going to a common destination,” Fernandez said. A possible-style boat in the ferry proposal.